Mutagenesis of yeast artificial chromosomes (YACs) often requires analysis of large numbers of yeast clones to obtain correctly targeted mutants. Conventional ways to isolate yeast genomic DNA utilize either glass beads or enzymatic digestion to disrupt yeast cell wall. Using small glass beads is messy, whereas enzymatic digestion of the cells is expensive when many samples need to be analyzed. We sought to develop an easier and faster protocol than the existing methods for obtaining yeast genomic DNA from liquid cultures or colonies on plates. Repeated freeze-thawing of cells in a lysis buffer was used to disrupt the cells and release genomic DNA. Cell lysis was followed by extraction with chloroform and ethanol precipitation of DNA. Two hundred ng – 3 μg of genomic DNA could be isolated from a 1.5 ml overnight liquid culture or from a large colony. Samples were either resuspended directly in a restriction enzyme/RNase coctail mixture for Southern blot hybridization or used for several PCR reactions. We demonstrated the utility of this method by showing an analysis of yeast clones containing a mutagenized human β-globin locus YAC. An efficient, inexpensive method for obtaining yeast genomic DNA from liquid cultures or directly from colonies was developed. This protocol circumvents the use of enzymes or glass beads, and therefore is cheaper and easier to perform when processing large numbers of samples. The yeast, Saccharomyces cerevisiae, is a simple eukaryotic organism well suited as a tool for analysis of mammalian gene regulation. Development of yeast artificial chromosomes (YACs)  greatly facilitated analysis of complex mammalian genetic loci by allowing cloning, maintenance, and manipulation of large stretches of exogenous DNA in yeast. More recently, YACs have been used to generate transgenic mice [2–4]. Introduction of mutations into YACs by homologous recombination coupled with the ability to produce transgenics provided a system to analyze the effect of the mutation in the context of the whole locus within an animal model. One of the steps in the process is the identification of yeast isolates containing mutant YACs. For quick analysis of yeast DNA, it is possible to perform PCR directly on yeast colonies . However, the utility of this method is limited, because often it does not confirm conclusively whether the mutation is located correctly within the YAC. Southern blot hybridization is more useful to confirm the correct targeting of the desired mutation. This protocol requires good quality genomic DNA, but a rapid isolation method is desirable to facilitate screening large numbers of colonies. The "smash and grab" rapid yeast genomic DNA isolation protocol utilizes disruption of the yeast cell wall by enzymatic digestion or physical fractionation of cells with small glass beads . DNA is subsequently purified using a mixture of phenol-chloroform, followed by ethanol precipitation. However, when processing a large number of samples, use of glass beads becomes cumbersome, or large quantities of enzyme must be used, which is expensive. Thus, we developed a protocol for rapid isolation of yeast genomic DNA from overnight liquid cultures or directly from colonies. Repeated freeze-thawing of cells in a lysis buffer is used to disrupt the cell wall and release genomic DNA, circumventing the need for enzymes or glass beads. Cell lysis is followed by extraction with chloroform and ethanol precipitation. Approximately 200 ng – 3 μg of genomic DNA can be isolated directly form a large colony on a plate or from 1.5 ml of an overnight liquid culture, with liquid cultures giving the higher yield. Resultant DNAs may be resuspended directly in a restriction enzyme/RNase cocktail mixture for Southern blot hybridization, or used in several standard PCR reactions. It is possible to isolate DNA from large number of clones and analyze these by PCR on the same day, or in a few days by Southern blot hybridization and phosphorimaging. We used an example from our own work to illustrate the utility of the technique. 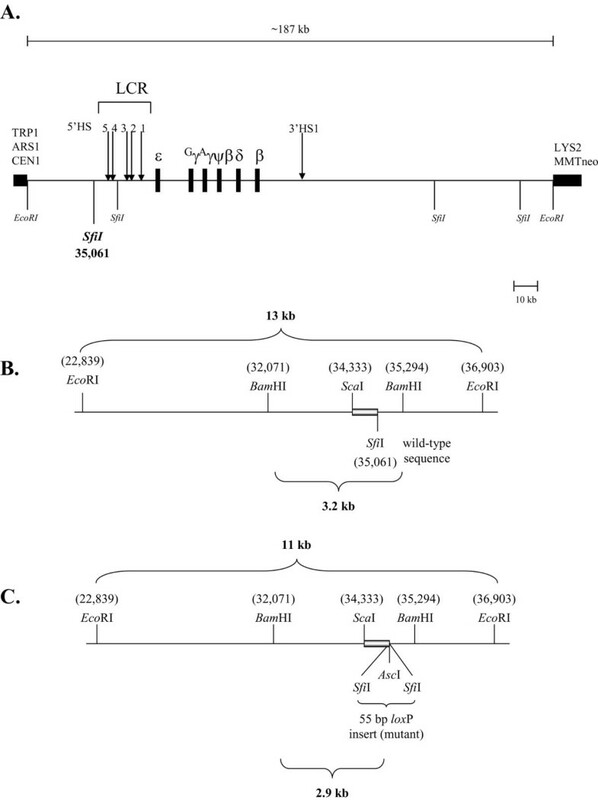 A loxP site was introduced upstream of the β-globin locus control region (LCR) 5' DNaseI-hypersensitive site 5 (5'HS5) within a human β-globin locus YAC (β-YAC) (Figure 1A) . LoxP sequences are recognized by bacteriophage P1 Cre-recombinase, which catalyzes recombination between two identical loxP sites, resulting in excision of the intervening DNA [8, 9]. Schematic representation of the human β-globin locus and sequences upstream of the LCR 5'HS5 region A) The human β-globin locus YAC (β-YAC). The ~187 kb EcoRI genomic DNA fragment containing the human β-globin locus is shown as a line above the YAC map. The β-like globin genes and YAC arms are shown as black rectangles. The LCR HSs are denoted with arrows. YAC arms contain a centromere (CEN), an autonomous replication sequence (ARS1), selectable markers for tryptophan and lysine prototrophy (TRP1 and LYS2, respectively), and an MMTneo cassette for selection in mammalian cell culture. B) Wild-type sequence with pertinent restriction enzyme sites labeled above and below the line. The 683 bp ScaI-SfiI probe used for Southern blot hybridization is indicated by the grey bar. C) A 55 bp loxP-AscI site was inserted into the SfiI site at nucleotide 31,061 by YIP-mediated homologous recombination. The numbering is based on GenBank file AF137396. A 55 bp DNA sequence containing the loxP site and a diagnostic AscI restriction enzyme site was introduced into the β-YAC by yeast integrating plasmid (YIP)-mediated homologous recombination . The wild-type target sequence is shown in Figure 1B and the desired mutant sequence is shown in Figure 1C. When a YIP carrying the desired mutation integrates into yeast DNA via homologous recombination, a duplication of the target sequence is created; one is wild-type sequence, the other is the mutant sequence. The wild-type and mutant sequences are separated by the YIP vector sequences including a selectable marker . The second step of YIP-mediated mutagenesis results in the loss of one of the duplicate sequences plus the YIP vector. The resultant YAC contains either the wild-type sequence, or the mutant sequence. The YAC structure following each of the recombination events must be confirmed, usually by Southern blot hybridization analysis . We utilized our bust n' grab method to isolate DNA from yeast isolates grown in liquid culture, as well as from colonies picked directly from plates. PCR and Southern blot hybridization assays were used to analyze the clones. DNA isolation from liquid cultures was performed as outlined in Table 1 and Materials and Methods. Two μl of each sample (~300 ng) was used for Southern blot hybridization analysis (Figure 2). Eleven of the 24 clones contained the desired mutation, as indicated by appearance of a 2.9 kb fragment on the autoradiograph (Figure 2). 1. Transfer 1.5 ml of liquid culture of yeast grown for 20 – 24 h at 30°C in YPD (1% yeast extract, 2% peptone, 2% dextrose) into a microcentrifuge tube. Pellet cells by centrifugation at 20,000 × g for 5 minutes. 2. Add 200 μl of lysis buffer (2% Triton X-100, 1% SDS, 100 mM NaCl, 10 mM Tris-HCl, pH 8.0, 1 mM EDTA, pH 8.0). 3. Immerse tubes in a dry ice-ethanol bath for 2 minutes, transfer to in a 95°C water bath for 1 minute. Repeat; vortex 30 seconds. 4. Add 200 μl of chloroform; vortex 2 minutes. 5. Centrifuge 3 minutes, room temperature, 20,000 × g.
6. Transfer the upper aqueous phase to a microcentrifuge tube containing 400 μl ice-cold 100% ethanol. Mix by inversion or gentle vortexing. 7. Incubate at room temperature, 5 minutes. Alternatively, precipitate at -20°C to increase yield. 8. Centrifuge 5 minutes, room temperature, 20,000 × g. Remove supernatant with a pulled Pasteur pipette by vacuum aspiration. 9. Wash the pellet with 0.5 ml 70% ethanol, spin down as described in step 8 above. Remove supernatant. 10. Air-dry the pellets at room temperature or for 5 minutes at 60°C in a vacuum dryer. 11. Resuspend in 25–50 μl TE [10 mM Tris (pH 8.0), 1 mM EDTA (pH 8.0)] or water. Samples obtained directly from plates should be resuspended in a 10 μl volume, because the yield will be smaller. 0.25 μl RNase cocktail (Ambion) should be added to the samples used for Southern blot hybridization (final concentration 0.125 U RNAse A, 5 U RNase T1). Southern blot hybridization of DNA isolated from liquid cultures Approximately 300 ng yeast genomic DNA was subjected to restriction enzyme digestion and fractionated by agarose gel electrophoresis followed by Southern blot hybridization (see text for details). The signals were visualized following a three hour exposure to a phosphorimage screen. Sample numbers are shown above the lanes. The wild-type fragment is indicated by the presence of a 3.2 kb band, the mutant fragment by the presence of a 2.9 kb band. The same DNA preparations were was also used to confirm the presence of the human β-like globin genes by PCR. 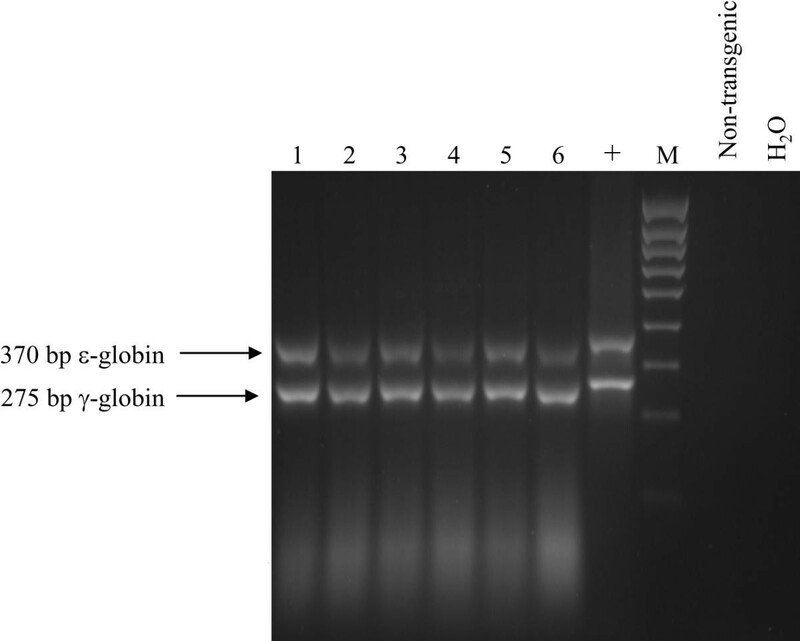 All samples produced a clear band for both globin genes, indicating that the DNA obtained by this method was of good quality (Figure 3). PCR of β-like globin genes using yeast DNA isolated from liquid cultures Two sets of primers were employed to confirm the presence of human ε- and γ-globin genes. Expected sizes were ε-globin: 370 bp, and γ-globin: 275 bp; the location of these bands is indicated on the left side of the figure. Numbers of samples and controls are indicated at the top of the figure. M = molecular weight marker. In summary, we have developed a rapid yeast genomic DNA isolation method that greatly streamlines the process of YAC recombinant characterization. In our method, a simple freeze/thaw cycle is used to lyse the cells, followed by chloroform extraction of proteins and lipids and ethanol precipitation to yield high-quality genomic DNA. Advantages of this assay are simplicity, use of smaller quantities of reagents, reduced time to completion, and avoidance of phenol and glass beads. Yeast colonies were picked from complete medium (CM) selective plates lacking amino acid lysine after two days growth at 30°C. Alternatively, single colonies were picked from those plates and inoculated into 2 ml of rich media (YPD; 1% yeast extract, 2% peptone, 2% dextrose), and grown in a shaking water bath at 30°C for approximately 20 hours. Cells from 1.5 ml of the overnight cultures were pelleted in a microcentrifuge tube and the cell pellets were resuspended in 200 μl of lysis buffer [2% Triton X-100, 1% SDS, 100 mM NaCl, 10 mM Tris-HCl (pH 8.0), 1 mM EDTA (pH 8.0)] . The tubes were placed in a dry ice-ethanol bath (or in a -80°C freezer) for two minutes (until they were completely frozen), then immersed in a 95°C waterbath for 1 minute to thaw quickly. The process was repeated once, and the tubes were vortexed vigorously for 30 seconds. 200 μl of chloroform was added and the tubes were vortexed for 2 minutes and then centrifuged 3 minutes at room temperature at 20,000 × g. The aqueous layer was transferred to a tube containing 400 μl of ice-cold 100% ethanol. The samples were allowed to precipitate 5 minutes at room temperature and then centrifuged 5 minutes at room temperature at 20,000 × g. Supernatants were vacuum aspirated using a pulled Pasteur pipette and DNA pellets were washed with 0.5 ml of 70% ethanol followed by vacuum drying for five minutes at 60°C. DNA was resuspended in 20 μl TE [10 mM Tris, 1 mM EDTA (pH 8.0)]. Occasionally cellular debris remains in the samples, but it does not interfere with subsequent analyses. The debris may be removed by using 200 μl of phenol-chloroform (1:1) instead of only chloroform during in the organic extraction step. DNA yield from liquid cultures ranged from 1 to 3 μg per sample. Digestion of yeast genomic DNA overnight at 37°C with 5 units each of BamHI and AscI (New England Biolabs, NEB, Beverly, MA, USA) produced either a 3.2 kb BamHI wild-type sequence fragment (Figure 1B), or a 2.9 kb mutant fragment, resulting from introduction of the additional AscI site (Figure 1C). RNAse cocktail (0.25 μl, Ambion, Inc., Austin, TX, USA) was included in the digests to remove contaminating RNA. DNA was fractionated on a 0.8% Seakem GTG agarose gel (BMA, Rockland, ME, USA) in 0.5X TBE (44.5 mM Tris, 44.5 mM boric acid, 1 mM EDTA) followed by capillary blotting onto positively charged ZetaProbe GT nylon membrane (Bio-Rad, Hercules, CA, USA) in 10X SSC (1.5 M NaCl, 0.15 M sodium citrate, pH 7.0). The blot was hybridized using a standard protocol with 1 × 106 cpm probe per ml of hybridization solution . The probe was a 683 bp ScaI-SfiI fragment located upstream of 5'HS5, and was radiolabeled using a DecaPrime II Kit (Ambion) in the presence of α-32P-dCTP (Amersham Pharmacia Biotech, Pisscataway, NJ, USA). Following two 15-minute washes [5% SDS, 20 mM sodium phosphate (pH 7.2)] the blot was exposed on a phosphorimager screen for three hours. One μl (~150 ng) from six different DNA samples that had the desired mutation was subjected to PCR amplification employing primers for the human ε- and γ-globin genes. The expected fragments were 370 bp for ε-globin and 275 bp for γ-globin. PCR was performed in a 50 μl reaction volume containing 50 pmol of each primer, 0.8 mM dNTPs, 2 mM MgCl2, and 0.3 U Immolase Taq Polymerase (Midwest Scientific, St. Louis, MO, USA). After an initial denaturation period of 7 min at 95°C, 30 cycles were performed, consisting of denaturation at 95°C for 1 min, annealing at 60°C for 45 sec and extension at 72°C for 1 min. 25 μl of the reactions were loaded on a 3% Seakem GTG/Seaplaque GTG (2:1) agarose gel and visualized by ethidium bromide staining. This work was supported by National Institutes of Health grants DK53510, DK61804, HL67336, and Lila & Madison Self Faculty Scholarship to K.R.P. and a University of Kansas Medical Center Training Program Award in Biomedical Research to S.H. S.H. developed the method and performed majority of the experiments. H.F. provided technical assistance. K.R.P. provided funding and supervision for the work. All authors have read and approved the final manuscript.